How and Where to Buy Pristiq? Order Pristiq through CanadianPharmacyWorld.com at the lowest possible price. Our Canadian International Pharmacy carries brand and generic medications online through Canada and other suppliers around the world. For more information about our pharmacy, check out About Us. Are there Alternative Names for the Brand and Generic Pristiq? 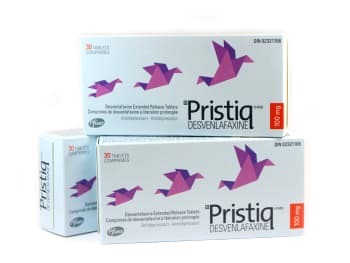 The Brand name Pristiq comes from Australia and Canada and is manufactured by Pfizer. The generic Desvenlafaxine Extended Release tablets also called D-Veniz comes from India and is manufactured by Sun Pharma. We may sometimes carry the generic from India also called Newven OD manufactured by Torrent Pharmaceuticals. What Dosages and Forms is Pristiq available in? What is Pristiq used for? Pristiq (Desvenlafaxine Extended Release tablets) is a prescription medication that is used to treat major depressive disorder. This medication belongs to the class of antidepressants known as selective serotonin and norepinephrine reuptake inhibitors (SNRIs). Desvenlafaxine works on the central nervous system to elevate mood by helping to restore the balance of certain natural substances in the brain. You may not see the full benefits of this medication after several weeks. The common side effects may include blurred vision, constipation, dizziness, drowsiness, dry mouth, excessive sweating, loss of appetite, trouble sleeping and weight loss. Are there any Precautions or Drug Interactions for Pristiq? You should not take Pristiq if you are allergic to Desvenlafaxine or if you have any other allergies. Before you start using this medication, talk to your doctor about your medical conditions and about all the medications you are currently taking including OTC and herbal medications. Desvenlafaxine can pass into breast milk and may harm a nursing baby. Pristiq should not be given to anyone under 18 years old without the advice of a doctor. There may be an interaction between Desvenlafaxine and other medications such as antipsychotics, cyclobenazaprine, lithium, norepinephrine, cabergoline, pseudoephedrine, venlafaxine and warfarin. Pristiq extended-release tablets are stored at room temperature between 20 and 25 degrees C (68 and 77 degrees F). It can briefly be stored at temperatures between 15 and 30 degrees C (59 and 86 degrees F). It should be stored away from heart, moisture and light out of reach of pets and children. It should not be stored in the bathroom.